The lower Deschutes boat ramp on Lake Billy Chinook is a good place to go diving in Central Oregon. You can go very deep here if you want or you can stay more shallow to check out the underwater cliff faces, the underwater rock formations, and search for things lost by boaters. The lower Deschutes boat ramp is an exciting place to dive because of the underwater cliffs and rock formations. Much like some of the other sites on Lake Billy Chinook, this site has a variety of terrain from relatively shallow sandy areas near the roped-off swimming spots to sheer vertical underwater cliffs. You can often find things that fell off boats around the boat ramp and other random odds and ends that went overboard in the general dive site area. There are a few small towns nearby including Culver, Metolius, and Madras. To the south, Bend and Redmond have some dive shops. There are signs on US 97 for Cove Palisades State Park. Follow them through a series of roads until you descend down into the canyon. Look for signs for the lower Deschutes boat ramp once you’ve crossed the bridge over the Crooked River finger of the lake. There is usually ample parking although on busy summer weekends, it can be completely full. The last time we were here, we had to pay a day use fee to park. Your Oregon State Parks Pass might work here but double-check when you go to park to see what you need to do. You can drop your gear off down by the boat ramp after you have your equipment setup and then go park in the car parking area. If it’s a quiet day with not many boat trailers, you can usually get away with leaving your car in the boat trailer parking. The lower Deschutes boat ramp is a good place to dive in Lake Billy Chinook. The underwater terrain is varied and you can go very deep if you want or you can stay shallower in a few areas. This site runs more or less north-south. There is a little bay in the middle of the site that heads east and is where the boat ramp is located. The little bay and the area around the roped off swimming spot are the shallowest and gentlest places to dive. If you go further west, north, or south, things get deep very quickly and also very steep. There are some vertical underwater cliffs as well. If you head west and don’t watch your gauges, you can go beyond recreational scuba depth limits so pay attention! If there isn’t much boat traffic, you can hop in at the boat ramp. Otherwise, the swimming beach is an easy entrance with a nice and sandy spot to walk in. To the west and south, there are a couple swim ladders you can climb in on from the wall where boats sometimes tie up. We have done this as a shore dive but you can also do boat diving here. 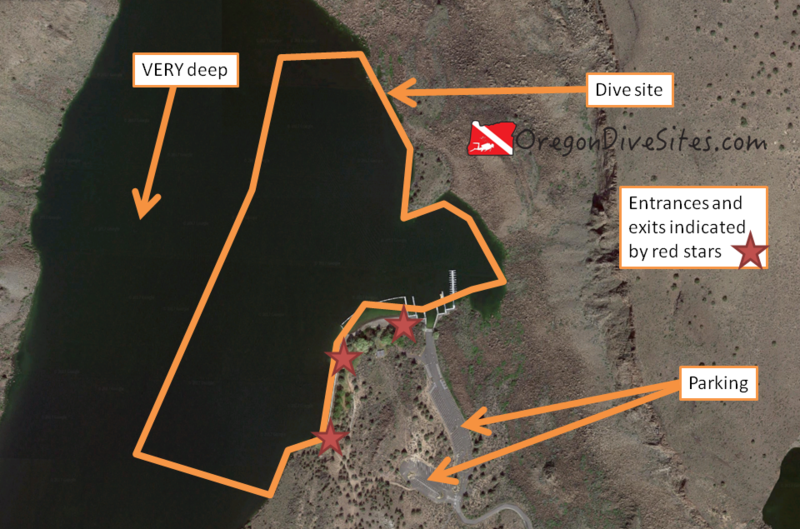 If you’re spending a long weekend on Lake Billy Chinook with your pontoon boat, this is a good dive site to check out your gear and practice your boat entrances and exits before motoring out into other parts of the lake. Usually there isn’t much current unless you get deep enough and usually there aren’t many naturally occurring waves. There can be waves and wake from boats passing by though. This lake is very popular with many different types of boaters so it’s important to fly a dive flag, even if you’re diving from a boat. Except in the swimming area and right around the boat ramp, visibility is usually pretty good with viz often being 40-60 feet or better. Where the water gets stirred up, it can be quite a bit lower. The bottom doesn’t have much to stir up. The deeper you go, the colder it usually gets at the lower Deschutes boat ramp. On the surface in late summer, we’ve seen in the 70s at this SCUBA site while at depth it can still be in the low 40s. This site is diveable any time of the year although we prefer summer and fall. We’ve gone down as far as 80 feet here but you can exceed the maximum recreational SCUBA depth limits if you aren’t careful. This is an altitude diving site. We suggest having at least advanced open water training because of the potential to go very deep very quickly. We rate this as an intermediate dive because of the depth. Depending on how close you can get your car, you may have to walk only a few feet or a couple thousand feet. No surface swim is necessary at the lower Deschutes boat ramp. This site has a lot of boat traffic during high season (summer and fall). Fly a dive flag! There are a few SCUBA shops in Bend that offer full service. We haven’t tried any of the restaurants right by the lake so please let us know if you have a favorite. There are several state and federal-run campsites in the area as well as a private resort with cabins for rent.